Workplace violence is a phenomenon affecting nurses worldwide (International Council of Nurses, 2009). Moreover, nonfatal injuries that require health care practitioners to take time away from work are primarily related to incidents of assault in the workplace (Wolf, Delao, & Perhats, 2014). Workplace violence incidents occur more frequently in emergency departments, nursing homes, and psychiatric settings (Edward, Ousey, Warelow, & Lui, 2014). Phillips (2016) reported that nurses are victimized at higher rates than other health care professionals because the assault rates are strongly correlated with patient contact time. Client-initiated violence is often the most frequent type of workplace violence encountered by nurses (Child & Mentes, 2010). Physical and verbal assaults are the major types of workplace violence incidents experienced by nurses (Taylor & Rew, 2011). At times, as many as 80% of nurses report feeling unsafe in their workplace (Child & Mentes, 2010). Nurses often experience significant physical and psychological effects after an incident of workplace violence (Edward et al., 2014). Consequently, nurses may choose to leave their workplaces and some even the nursing profession due to workplace violence incidents (Edward et al., 2014). The current article presents a review of evidence-based interventions that can help nurses minimize the incidence of workplace violence. CINAHL and PubMed were the online databases selected for the literature review. Search terms included workplace violence, interventions to manage workplace violence, physical assaults by patients, violence, nurses, and patients. These terms were selected to locate journal articles discussing workplace violence incidents against nurses perpetrated by patients. Article types were limited to academic journals, systematic reviews, peer-reviewed articles, abstracts, and full text. To obtain the most current literature on workplace violence, the publication date limit was 2009–2016. Another limit used in the search was articles written in English. After applying these limits, CINAHL yielded 64 articles and PubMed yielded 41 articles. Articles were further collated by selecting a specific journal abstract in conjunction with qualitative, quantitative, and systematic review articles. 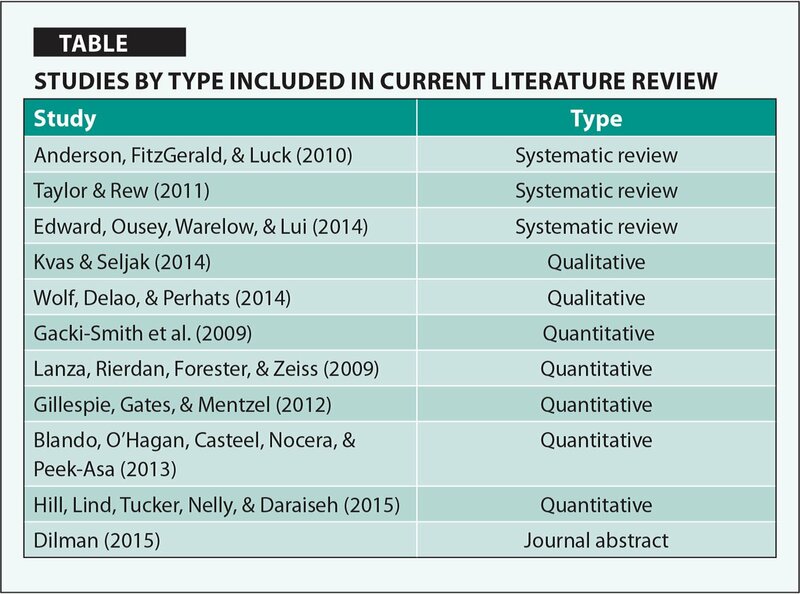 Systematic reviews were given priority because of their value in current content and evidence on the subject. Randomized controlled trials and meta-analyses were not found during the literature search. Quantitative studies containing specific interventions to manage workplace violence and nurses' experiences were also selected. Qualitative studies that included data on nurses' experiences with workplace violence and suggestions for managing those incidents in nursing settings were also included. A journal abstract containing an evidence-based intervention presented at a nursing meeting was also given consideration. Furthermore, to maintain the main focus of the research, articles discussing assaults perpetrated by patients specifically against nurses were also included. Articles that mentioned assaults perpetrated by visitors, violence against nursing students, and assaults against personnel other than nurses were excluded because the main focus of the current research was client-related violence toward nurses. Articles that were unrelated to the main topic were also excluded. Unpublished theses and dissertations were not considered during the literature search. Eleven articles/abstracts were used in the current review (Table). Staff, environmental, and patient risk factors are the major precursors associated with workplace violence incidents initiated by patients (Taylor & Rew, 2011). Taylor and Rew (2011) conducted a systematic review using MEDLINE, CINAHL, and PsycINFO databases to obtain journal articles as well as dissertations and theses from full text databases. A total of 16 articles were used and included qualitative and quantitative studies testing an intervention. A limitation of their review was the specific articles used pertained solely to the emergency department. Poor security, delays in service, and working closely with potentially dangerous individuals were found to be the most common environmental risk factors. Patient risk factors included access to guns and substance abuse. Staff risk factors included inadequate or nonexistent training on the management of assaultive behaviors, understaffing, and working alone (Taylor & Rew, 2011). Many nurses often view workplace violence as part of the job (Child & Mentes, 2010). In some instances, when nurses work in settings where violent incidents occur frequently, a culture of acceptance of violence persists (Wolf et al., 2014). Blando, O'Hagan, Casteel, Nocera, and Peek-Asa (2013 evaluated whether nurses' perceptions of violence and safety were influenced by their work environments and also identified whether their perceptions were correlated with actual risk. The study was a cross-sectional survey that was administered to 314 emergency department and 143 psychiatric nurses working in various hospitals in California and New Jersey. In addition, incidence of workplace violence, response of security guards, and appropriate training were found to play a role in nurses' perceptions of violence and safety in the workplace. The authors noted that perceptions of violence vary among nurses, and they are affected by existing conditions in the workplace. Differences between emergency department and psychiatric nurses were significant. Emergency department nurses were more likely to report feeling unsafe and more threatened when they were verbally assaulted compared to psychiatric nurses. Moreover, psychiatric nurses were more tolerant of abusive behavior and had more training in de-escalation practices. Furthermore, Blando et al. (2013) used a univariate logistic regression statistical analysis to identify the major variables that measured the outcome of the emergency department nurses' perceptions of safety. A multivariate logistic regression was further performed on those variables showing that response time by security personnel, appropriate security equipment, and frequent verbal abuse were significant in the emergency department nurses' perceptions of safety. The researchers reported that nurses' perceptions of violence and safety may not correlate with the actual risk, as statistical analyses showed differences between the perceptions and actual rates of assault that occurred in the emergency department (Blando et al., 2013). Underreporting of incidents of workplace violence often occur in nursing settings (Child & Mentes, 2010). Gacki-Smith et al. (2009) conducted a cross-sectional study surveying RNs (n = 3,465) of the Emergency Nurses Association to explore their perceptions and experiences with violence perpetrated by patients and visitors in U.S. emergency departments. Major barriers that contributed to the phenomenon of underreporting workplace violence incidents included nurses' fear of retaliation by their employers and little support from administration (Gacki-Smith et al., 2009). Kvas and Seljak (2014) conducted a study about the issue of underreporting of workplace violence incidents using a survey method to obtain the responses of 692 nurses working in hospital settings in Slovenia. Study findings included nurses' fear of losing their jobs and their belief that reporting those incidents would not change any current practices against workplace violence (Kvas & Seljak, 2014). Although the study was conducted in a foreign country, the results concurred with the qualitative findings reported by Gacki-Smith et al. (2009), increasing the generalization of the results. Dilman (2015) presented the use of a code green response team (CGRT) as an evidence-based intervention implemented in 2013 in a Pennsylvania hospital. The CGRT comprised a charge nurse, security personnel, and the physician and primary nurse managing the potentially violent situation. The major functions of the CGRT included using the least restrictive measures, such as verbal de-escalation skills and noncoercive use of medications, to control violent or escalating situations. Data were collected for 1 year using a post-violence debriefing tool and an incident report form to measure the rates of restraints applications and de-escalation of potentially violent patients. The results demonstrated that 85% of code green calls resulted in successful resolution of the violent incidents using verbal de-escalation skills and noncoercive medication administration, and a decrease of restraints application in nursing units by 11% compared with restraint data obtained in 2012. The effectiveness of the evidence-based intervention showed a reduction of patient restraints and effective management of aggression using least restrictive measures in a hospital (Dilman, 2015). Hill, Lind, Tucker, Nelly, and Daraiseh (2015) implemented a quality improvement initiative in an Ohio hospital to decrease staff injuries in an inpatient psychiatric unit specialized in treating children and adolescents with developmental disabilities and other co-occurring psychiatric disorders. Hill et al. (2015) employed the Plan, Do, Study, Act (PDSA) rapid interventions testing process to investigate the interventions and continue decision making. Occupational Safety and Health Administration (OSHA) reportable injury standards were used to record the types of injuries that occurred in the unit during the initiative. A major intervention used was the creation and implementation of universal precautions posted in the unit for clinical staff members, including nurses and unlicensed personnel. Universal precautions included the following: be aware that patients have the potential to strike-out; wear appropriate clothing; rearrange environments in the setting to minimize the risk of injury with objects during crisis; maintain appropriate positioning when approaching patients; keep a safe distance; sustain the proper stance (i.e., show one third of the body when working with patients); use protective personal equipment, such as gloves and forearm and knee pads; and learn and use de-escalation techniques and active listening (Hill et al., 2015). Moreover, other interventions used included standardized team meetings to increase awareness of potentially violent patients and plan for crisis; bedside handoff to review patients' problematic behaviors and approaches taken; patient information binders and boards identifying high-risk behaviors; critical incident reviews; leadership rounds conducted by directors of nursing, psychologists, quality managers, and other supportive members to assess the interventions used by staff; proper use of protective personal equipment; and conducting risk identification (Hill et al., 2015). The quality improvement initiative showed a 65% reduction of staff injuries, from 2.2 per week to 0.77 per week, during the 1-year intervention period. In addition, the days in between occurrences of OSHA-reportable injuries increased from 26.5 days to 124 days (Hill et al., 2015). Lanza, Rierdan, Forester, and Zeiss (2009) conducted a pilot study to assess the efficacy of a violence prevention community meeting (VPCM) in decreasing the prevalence of workplace violence in an acute in-patient psychiatric setting. The major intervention of the VPCM was a 30-minute meeting that focused on violence prevention topics in psychiatric settings, which was conducted twice per week by nursing staff during the day shift and attended by patients. During the 9-week pilot study, nursing staff led community meetings in the inpatient psychiatric unit, encompassing a number of topics to prevent workplace violence, including, but not limited to: establishing unit rules, importance of safety in the unit, what to do if losing control, modeling problem solving, discussions of violence reduction, discussions of reactions regarding assaults, and discussion of accepted alternatives to violence (Lanza et al., 2009). Nursing staff adjusted the topics discussed during the meetings according to the acuity in the unit. The recording of workplace violence events in the unit was conducted by nurses and researchers in real time during the course of the study. The VPCM program was effective, reducing incidents of violence by 85% among all shifts throughout the duration of the study. The study presented a validated evidence-based intervention with promising results to manage workplace violence that can be implemented in inpatient psychiatric settings (Lanza et al., 2009). Anderson, FitzGerald, and Luck (2010) conducted a literature review to evaluate interventions aimed at decreasing violence against emergency department nurses. The authors used MEDLINE, CINAHL, and the Cochrane Library to conduct their literature research. The authors cited the study by Meyer, Wrenn, Wright, Glaser, and Slovis (1997) that implemented the use of a metal detector under the continuous surveillance of a security guard as a major intervention addressing environmental risk factors in the emergency department (Anderson et al., 2010). The study by Meyer et al. (1997) evaluated the patrons' and emergency department nurses' perceptions regarding the use of a metal detector in this setting. The study results showed that 80% of patrons and 85% of employees liked the idea of having a metal detector in the emergency department; 90% of patrons and 73% of employees felt safer (Meyer et al., 1997). The study presented an intervention that was implemented in one emergency department, which can be implemented in other emergency departments and nursing units. Gillespie, Gates, and Mentzel (2012) conducted a quasi-experimental study to evaluate the effectiveness of delivering an educational program on workplace violence for 315 nurses using web-based and classroom-/web-based hybrid programs. The study results showed that the classroom-based program may have a positive effect on the information being taught when used in conjunction with a web-based program to enhance knowledge attainment among nurses (Gillespie et al., 2012). Nurses often experience psychological and physical effects after an incident of workplace violence, which may impact their careers and personal lives. Edward et al. (2014) conducted a systematic review about workplace violence against nurses to understand the types of aggression, effects on nurses, and coping strategies used by nurses. The authors used MEDLINE, CINAHL, and PsycINFO databases to conduct their literature search. They found that nurses who encountered aggression in the workplace may experience anger, frustration, feelings of hopelessness, hyper-vigilance, post-traumatic stress disorder, develop depression or anxiety, and even leave the nursing profession (Edward et al., 2014). Taylor and Rew (2011) noted that physical assaults may cause fatal and nonfatal injuries and reduce nurses' ability to perform job requirements. Educating nursing personnel on the appropriate management of aggressive behaviors is vital to decrease the incidence of workplace violence and promote safety for staff and patients (Martindell, 2012). Nurse managers should make the availability and inclusion of appropriate training programs a priority for nursing staff to prevent and effectively manage incidents of workplace violence. Training programs to manage workplace violence should include specific and practical skills, such as recognition of aggressive cues and behaviors, building therapeutic rapport, enhancing communication skills, using verbal de-escalation skills, and using team approaches for managing assaultive behaviors in clinical nursing settings (Casella, 2015; Dilman, 2015; Gacki-Smith et al., 2009; Hill et al., 2015). The Johns Hopkins Nursing Evidence-Based Practice Non-Research Evidence Appraisal Tool (access http://www.hopkinsmedicine.org/evidence-based-practice/_docs/appendix_f_nonresearch_evidence_appraisal_tool.pdf) was used to evaluate the evidence provided in the articles included in the current review because randomized controlled trials or meta-analyses were not found. The quality of evidence can be assessed using a rating scale of high (A), good (B), and low/major flaw (C). Systematic reviews were evaluated using levels I–IV. Intervention studies were evaluated using the tool's section on clinical practice guidelines. Qualitative studies were evaluated using the tool's section on organizational experience. All articles included in the current article obtained scores ranging from A to B.
Nurses should be aware of the availability of training programs to manage workplace violence in their health care settings. Nurses must advocate for themselves by voicing concerns and possible solutions to administrators to reduce the incidence of workplace violence. Furthermore, nurses should increase their knowledge and awareness of evidence-based interventions by reading peer-reviewed journal articles analyzing interventions and approaches to manage workplace violence. Nurses should also implement evidence-based interventions learned in their training programs at their facilities to minimize violent events. The role of nursing administration is critical to combat the phenomenon of workplace violence in clinical settings. Nurse managers can assess the staff and environmental risk factors in their nursing units and implement appropriate interventions to reduce risk factors. Nurse administrators should heed nurses' concerns about safety in the workplace, listen to their suggestions to manage violent events, and address those issues with the implementation of evidence-based interventions to decrease the prevalence of workplace violence. More research studies preventing and managing workplace violence with evidence-based interventions are critical to reduce the prevalence of such events in clinical settings. Researchers should create and validate more evidence-based interventions and approaches in future studies that could be implemented across nursing settings to reduce the incidence of aggression against nurses. The current review has two major limitations. Three of the quantitative studies discussed interventions used to manage workplace violence primarily in emergency department and psychiatric settings, which may affect the generalizability and transferability of interventions outside those specific milieus. Qualitative studies used in the current literature review evaluated nurses' experiences with workplace violence incidents. The types of incidents nurses experienced ranged from verbal, physical, or a combination of those forms of violence. As a result, nurses' self-reported answers collected as data may demonstrate a potential for bias, as some nurses may have experienced only verbal assault and others may have experienced physical or both forms of violence. There is substantial evidence regarding workplace violence prevailing in clinical nursing settings. Workplace violence can significantly affect nurses' physical and psychological well-being. Implementation of evidence-based interventions can help decrease the incidents of workplace violence, as demonstrated by Dilman (2015), Lanza et al. (2009), and Hill et al. (2015). More research studies focusing on creating and testing evidence-based interventions aimed to prevent and manage workplace violence are needed to decrease the prevalence of this unwanted phenomenon in clinical settings. Dilman, Y. (2015). EB72 code green for workplace violence. Critical Care Nurse, 35, e34–e35. Mr. Solorzano Martinez is Psychiatric Nurse, Inpatient Adult Psychiatric Unit, Saint Francis Memorial Hospital and California Pacific Medical Center; and Psychiatric Nursing Clinical Instructor, Samuel Merritt University, San Francisco State University, and University of San Francisco, San Francisco, California. Address correspondence to Angel Johann Solorzano Martinez, MSN, MBA, RN, Psychiatric Nurse, Inpatient Adult Psychiatric Unit, Saint Francis Memorial Hospital and California Pacific Medical Center, and Psychiatric Nursing Clinical Instructor, Samuel Merritt University, San Francisco State University, and University of San Francisco, 1600 Holloway Avenue, San Francisco, CA 94132; e-mail: onlyjohann@hotmail.com.